2014 SUBARU OUTBACK- Of course the price was outstanding. 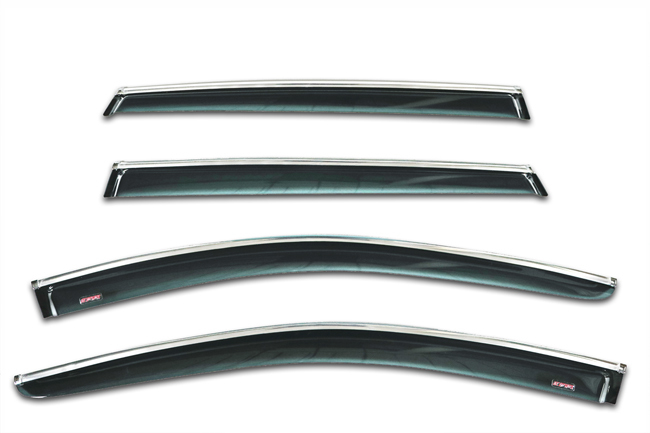 The chrome strip is very attractive addition compared to what you find most auto parts stores for other vehicles. Wish the company the best. So C&C CarWorx Corp. really backs their products. I sent them a message telling them that the rear visors failed (see below update). I wasn't sure of their warranty but over two years had passed since I bought/installed the visors. Without question, they apologized for the oversight in that manufacturing batch and sent me a new set of visors, which I received today (4 days since email). 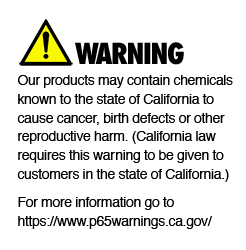 The product was always good for the price, but with a company that backs their product like this, I've changed my rating to 5-Stars. I've reduced my rating to 3-Stars. The visors for the rear doors have purpled over the two years I've had them installed. The front visors are the same color as the day I installed them, but it looks like the rear ones were from a different manufacturing batch and didn't get the proper UV stabilizer added to the plastic. 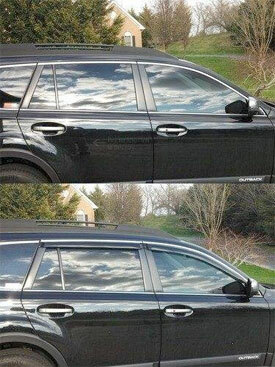 (If you've ever seen a car with purple tint on the windows, that's a low quality tint that is affected by the Sun and doesn't have the stabilizers that higher quality tints do...same concept here). Also, the 3M tape that holds it on is failing in some spots, but not on the install/car side, it's failing on the visor's plastic - even pulling away completely in some spots. Only little spots though, the visors are still holding strong. I'm disappointed in the color degradation though. I've added another picture here that shows a front visor (with no color loss) and the rear visor next to it (showing the purpling - which is a verb now!). I didn't take a picture specific to the tape failing, but you can see it in the pupled picture, there are air bubbles showing where the visor and 3M tape are in disagreement. 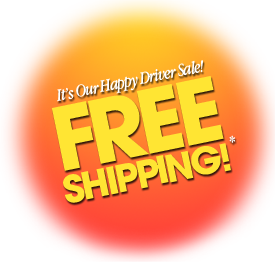 Overall, it's still a good product and not noticeable on day-to-day issues, but completely in-you-face if you were to be showing off your car. Still half the cost of a Subaru Genuine rain guard set. So I just got these and installed them yesterday...which means I can't review the durability of these yet. But with that said, these appear to made out of a good quality material and I don't foresee any issues. They're installed on the car with 3M automotive tape. 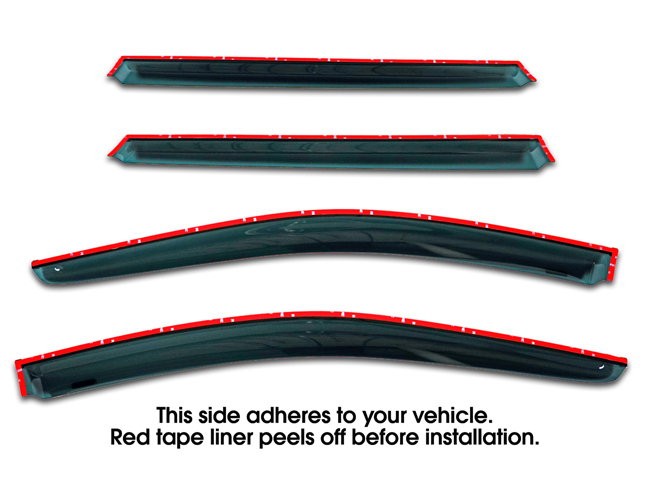 The tape is already mounted to the visors, so you just peel off the exposed side and stick it to the car. With my Outback, it already had chrome accents, and these aftermarket visors match pretty well. Took me about 15 minutes to install all 4 pieces...that includes cleaning the car surface. As with any adhesive, you want a clean, grease/dirt free surface to mount to or the tape/glue/etc. will fail after a while. The visors fit well, but the rear windows are about 4mm shorter than I would have liked. If you line the front side up with the outer edge of the door, the back side will be a little short. This is just me being a perfectionist, and ultimately isn't noticeable unless you're looking for it. The front visors don't go all the way down, so you can line the top edge to the outer edge of the door. Personally, I would've liked the front visors to extend about 1.5-2" further, but that's a "me" thing maybe. The visors hold at highway speeds without even budging and I didn't notice any increased wind noise. I got them a day earlier than promised and I had good weather to install them. One thing that was missing was instructions but I was still able to install without much difficulty. There was a couple issues (one on each side). When I put on the front ones I had to make sure that they were close to the upper edge of the door by the mirror but other than that they look great. Don't be fooled by the price, very good Quality! 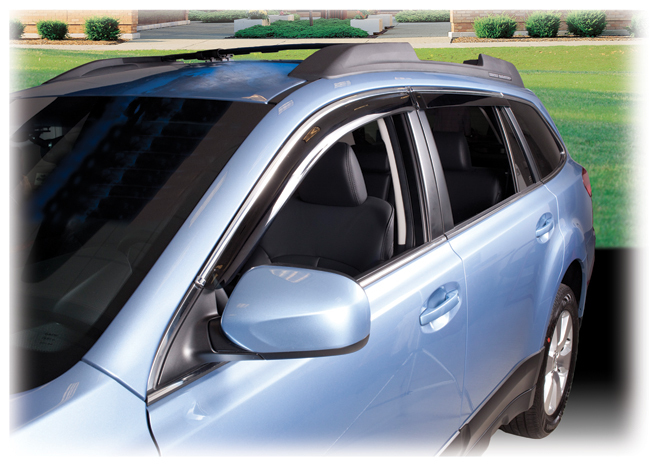 The C&C CarWorx window visors are a high quality visor. They fit perfectly on the 2013 Subaru Outback we own. 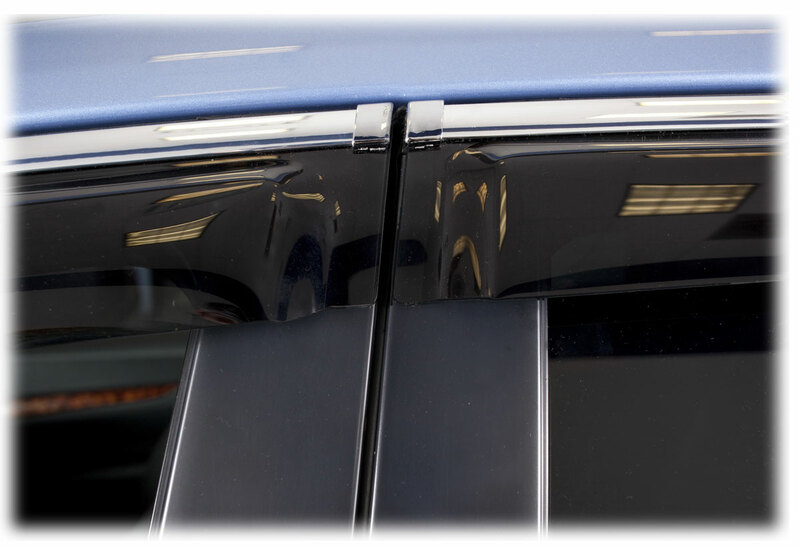 Instalation was quick and easy, the chrome trim blends them perfectly with the window trim. I'm glad I saw them here on Amazon, I would recomend them to any Outback owner. Just ordered these for my 2010 Outback and they arrived in 2 days flat no problem! They seem to be very high quality, and fit my car perfectly. 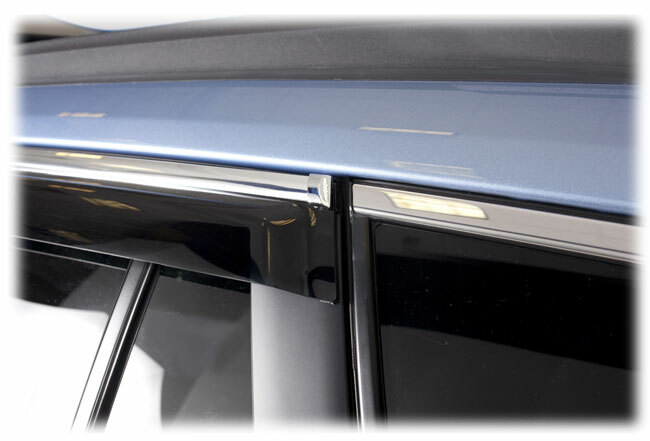 The chrome trim is a very nice extra, and match the existing chrome trim around the windows to a tee. Installing them couldn't be much easier, although care is required in getting them positioned properly because when you touch the tape to the trim where they will be attached there's no going back. They even come with 4 alcohol wipes to clean off the surface where you will attach them. I had no problems installing (read instructions FIRST) and I had all four on in less than 30 minutes, including removing the rather tricky backing from the self-stick tape. These also come with a protective tape film on the chrome, a nice extra! These really help in keeping your car cooler on hot summer days, and will provide some draft during sticky rainy times when the interior of the windows may fog up easily. 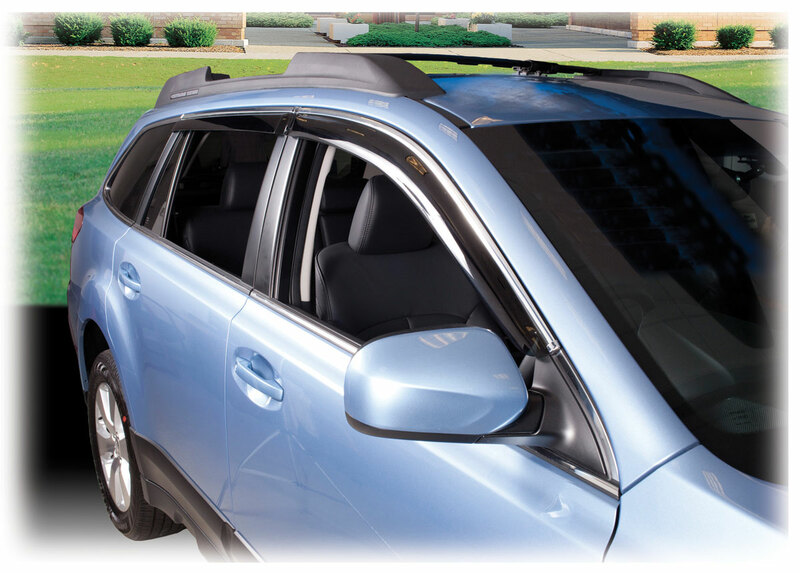 It also allows windows to be cracked a couple of inches during a rain without getting your car seats or carpet wet. Since I have just installed them I can't comment on their durability just yet, but I foresee no problems in longevity. The directions do state that the adhesive on the Scotch automotive tape does take 72 hours to cure, and that you should not get them wet or wash the car during that time at the start, but that is more common sense than anything I guess. I highly recommend these visors and couldn't be happier with this purchase. Look OEM for sure and I can't say enough good things about this product! Wow! This is the deal of the year for me, so far. This set of four window vent covers for my '12 Subaru Outback arrived quickly and is of high quality material, just as described. The chrome accent matches what is on the car and installation was easy. My one nit-pick is that the leading end of the front covers could be 2" longer. 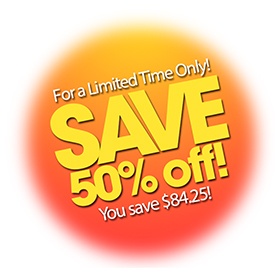 For the price, which is half of a big-name brand, and the quality, buying this a no-brainer. Thus far, these things are great: the acrylic is crystal clear; the chrome/foil accent strip makes 'em look like they belong, and they fit a 2014 Outback perfectly: no added noise at 70+ mph. Ran the vehicle through an automatic carwash and the adhesive is giving no hints of failure.